To build a great mobile app, you need the right skills, tools, and support. That’s why many companies are turning to integrated and collaborative mobile application development environments that let them meet business needs and exceed customer expectations. 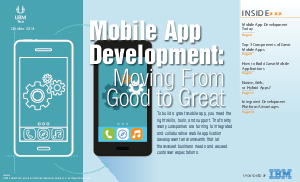 Download this eBook to see how mobile application development environments can help your business while blowing away your customer's expectations.